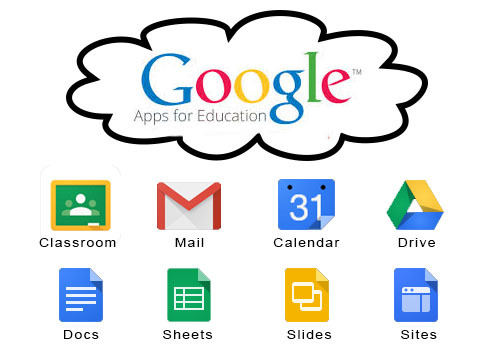 Google Apps for Education: “Technology can become the “wings” that will make educational world fly farther and faster if we allow it”. The current age we are living in, technology has become an important component. With Technology we can remove the limitations of traditional classroom and transform the way we teach and learn. To overcome the limitation of traditional classroom, the school has incorporated Google Apps for Education wherein we can learn anytime, anywhere through the web. With tools such as Drive, we can collaborate on projects with others around the school. In addition to the obvious benefits of collaboration and familiarity with technology, we prepare students for the outside world in many innovative ways. It is a package of online applications that aims at having a circulatory among the parents, even more easily and efficiently. It provides 25 GB storage repository to each parent and student individually in order to share documents and have an access to the Google calendar for coordination the schedules, with Gmail as its corner store. We have made Google Site for each classroom to present the research of the students and their joint efforts. With Google Calendar, school timetable along with the books which needs to bring to the school is updated weekly so that the children are not burdened with the weight of the books.